Written in collaboration with Hauser & Wirth Zürich’s Jean Dubuffet exhibition (June 10–September 1, 2018), curator and author Dr. Sophie Berrebi presents Jean Dubuffet and the City: People, Place, and Urban Space, a gem of a book that could easily set a new standard for art publications as well as exhibition catalogs. Berrebi’s thesis is simple: to “trace and identify signs of the city in Dubuffet’s oeuvre.” Depending upon the piece or series under discussion, the evidence to support this inquiry ranges from a mere statement of the obvious to a deeper insightful interpretation of clues. People, Place, and Urban Space are the three categories into which Berrebi gathers up Jean Dubuffet’s artistic interests, idealogical obsessions, and human-sociological observations. With no shortage of examples to choose from, content is king, ruling mightily over each section. That Berrebi could distill three categories out of Dubuffet’s lifetime achievements is a testament to her scholarly discipline. Dubuffet (1901–1985) was a man of many layers, contradictions, enigmas, opinions, and persuasions. He specialized in double (or triple, or as many as possible) entendres for his paintings, drawings, and sculptures. He cranked out thousands of pieces over 40 years in any medium imaginable. For Berrebi to suggest such a simple designation to his accomplishments is brave and bold. In Dubuffet’s earlier works such as Vue de Paris, quartiers résidentiels and Vue de Paris, le petit commerce (both dated 1944) it is no stretch to see the connection to the city. Buildings, streets, people are all easy enough to identify. What Berrebi focuses on with these examples is the play on visual perspective and the focus on cityscapes as a theme in art history, where Dubuffet’s career is born and launched. Right from the first chapter, Berrebi expands her initial thesis. Not only can elements of the city be seen in different aspects of Dubuffet’s work, but, even more profound and significant, she asserts that the city is actually the central pivot and driving impetus for his entire oeuvre. As astounding and audacious a claim as that may be, Berrebi carefully and conscientiously sets out to justify her position. In pieces such as Argument et context (1977) or Main leste et recousse (1964) the connections to the city are visually oblique but ideologically solid. For abstract works such as Chaussée grise (1957), it’s not until one translates the title (Grey Sidewalk) and learns that the materials Dubuffet employed—dirt, concrete, debris—where taken directly from the earth of the city, does one begin to understand where Berrebi is coming from. While Dubuffet used the city as subject matter and then incorporated the stuff and grit of the city into his medium, he ultimately interacted with the city by creating architectural/sculptural exchanges. As part of the urban planning conversation in Paris, Dubuffet argued passionately against skyscrapers, harsh lines, and high-rise living. His sculptures created monumental counterparts to the massive urban construction projects of the 1960s and 1970s. He challenged the way developers, architects and engineers thought about the space around them. For him, “The city becomes a canvas, or the canvas . . .” It is on this canvas that people will move, breathe, and experience life. Such a space ought to be designed with artistic intension. Stopping here, there could be enough to satisfy the criteria of a well written book. In her concluding remarks, Berrebi has rested, and succeeded in persuading the reader to favor her succinctly prepared case. From a scholarly point of view, where the narration ends, this book is satisfying and complete. However, while content may be king, presentation shares the realm equally as queen. Dubuffet is often considered a “master of European Modernism,” and the publishers took advantage of this propensity in the aesthetics of the book. The designers (Mevis & van Deursen, with Marius Schwartz), made copious use of intriguing modernist touches. Blue ink on stark white paper in the chapter essays contrasts nicely with the black ink on gold paper for the translated Dubuffet-penned transcripts. Blue, gray, gold, and white paper separate, enliven and organize chapter content and illustrations. The header information has been relocated from its traditional position at the top of the page to be vertically hugging the gutter. The modern san-serif Univers typeface contrasts with the newsy Courier font used in the framing headers and footers. The text pushes the boundaries of the margins as far as it can making the reader actually feel edgy and avant-garde. Translations of French quotes and Dubuffet’s writings are fascinating examples of intense poetic convictions. Period photographs are interspersed strategically from chapter to chapter. Full color images of Dubuffet’s sometimes crowded artworks fill every inch of the page, pushing boundaries, begging to venture further if only they could use some of their pent-up energy to do so. Even the cover is a unique character in this story. A soft vinyl-like fold out, featuring a panoramic image of Dubuffet’s monument-sculpture La rue (1971– 1974), it is so tactilely alluring the reader won’t want to stop touching the book. Clutching this book, with its variety and ingenuity, pages will flip quickly. Jean Dubuffet and the City: People, Place, and Urban Space is a keeper. Much like Dubuffet’s artwork itself, this project is a huge win for the art world. 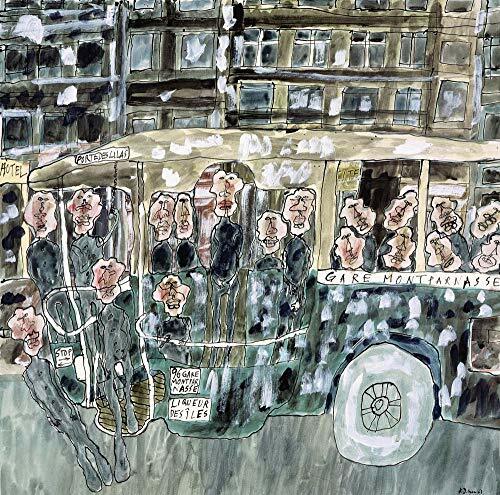 Classy and scholarly, punchy and approachable, Jean Dubuffet and the City demonstrates what future research and curating could offer to the next generation of art history publications.